The resurrection of Jesus, I confess, grows less interesting to me as I grow older. It’s not, I think, because my edge has grown dull in thirty-five years of trying to say something new and worthwhile about Easter. It’s because in this season of my life the issue of Easter has changed. Today I’m less interested in whether there’s life after death than I am in whether there is life before death. It’s not the resurrection of Jesus that’s my primary concern (I’ve come to take that for granted); it’s my own. It’s not the body of the risen Christ I want to know about; it’s the power of resurrection in my life that draws my attention (Phil. 3:10-11). Like Paul, I want to know that just as Christ was raised from the dead by the power of God, I, too, might walk in newness of life (Rom. 6:4). I want to know that the God who raised Jesus from the dead will give life to my mortal body also (Rom. 8:11). It’s not that the resurrection of Jesus is unimportant. “For I would remind you,” Paul wrote to the Corinthians, “of the good news that I proclaimed to you, which you in turn received, in which you also stand. For I handed on to you as of first importance what I in turn had received: that Christ died for our sins in accordance with the scriptures, and that he was buried, and that he was raised on the third day in accordance with the scriptures, and that he appeared to Cephas, then to the twelve” (1 Cor. 15:1, 3-5). For the author of the earliest Christian scriptures in our Bible, it was of supreme importance. Without the resurrection of Jesus, we have no gospel, no faith, no hope. “If Christ has not been raised,” Paul wrote, “your faith is futile and you are still in your sins. If for this life only we have hoped in Christ, we are of all people most to be pitied” (1 Cor. 15:17, 19). There’s a reason why Easter Day is the most important day in the church’s calendar. 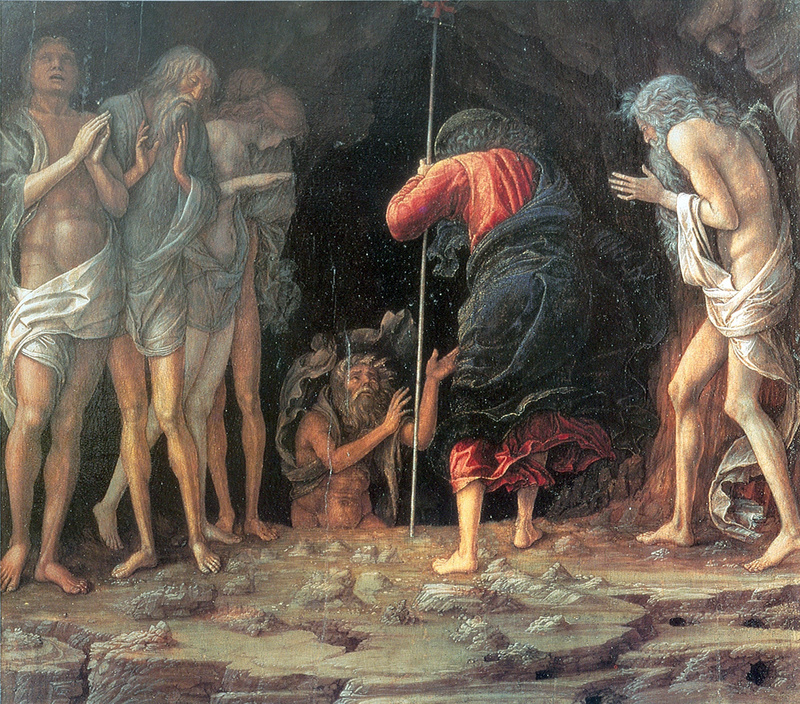 Yesterday, Holy Saturday, was the day marked by many Christians as the Harrowing of Hell. An ancient and respected tradition in the church holds that after Jesus was crucified, he descended into hell. Some versions of the Apostles’ Creed still refer to it. According to fifth-century patriarch Cyril of Alexandria, “When the gatekeepers of hell saw him, they fled; the bronze gates were broken open, and the iron chains were undone.”1 When Christ was set free from death, all the dead imprisoned in hell were also set free and returned to God. Several of our scriptures allude to this. Can I – can you – accept a triumph so complete, a God of such grace, a Christ of such power? Something in me, I confess, cannot. Something in me wants to affirm the limitations that bind me, the grave that holds me fast, the judgment that consigns me to hell. For then nobody can expect as much of me, and I don’t have to expect as much of myself. Then I can say: I have weaknesses, therefore I cannot; I’m a sinner, therefore I’m not able; I have been judged, therefore I’m unworthy. Then I have a reason for settling for what I have always been. I’m not talking about fear of spiders or of heights, of course. I’m talking about the fear that keeps me silent about Christ in an unfamiliar and maybe unfriendly crowd. I’m talking about the fear of being in need someday that makes me keep the real surplus I have instead of sharing it generously with someone who needs it. I’m talking about fearing to reveal my faults and failures for fear of feeling shame or setting myself up for rejection, instead of seeing them as empty cups to be filled with God’s grace, as thin places where new life might break through, as opportunities for a ministry of healing and growth with others (cf. 2 Cor. 1:3-7). If I want more than to read about the resurrection of Jesus; if I really believe the Christian scriptures, that my resurrected life is not merely held in store for some day in the indeterminate future; if I want to know the power that comes with living resurrection today, then I’ll have to surrender my fear and risk living my faith not in theory but for real. I’ll have to strip off the terribly comfortable patterns of life that my culture and upbringing dictate. The message of the risen Christ is, Be not afraid: Choose resurrection-in-life, unfamiliar and threatening as it may seem. Be not afraid: Choose resurrection-in-life, though you feel certain you’re not ready for it. For the Easter proclamation is, new life is ready for you. God has served it up and laid it before you, and all you have to do is feast on it. notes — 1. Ancient Commentary of Scripture 11.107. ▪ 2. Ephraim the Syrian, Nisibene Hymns 36.11. ▪ 3. Facebook posting, 4 April 2015.